Plot synopsis: Eleven members of a jury vote that a man accused of murder is guilty - can the single holdout persuade them to change their minds? Review: A brief summary of this episode's plot, as I have given above, may give the impression that it is little more than a poor facsimile of Twelve Angry Man (which was originally a television play - before becoming a stage production and the famous Henry Fonda film - broadcast in 1954, the year before this radio episode). At any rate, this is what I believed at the start, since the set-up and first act are extremely similar: the story takes place in the jury room of a murder trial, with one juror seeking to persuade the eleven others of the accused man's innocence. However - SPOILER ALERT! - those familiar with Twelve Angry Men may be greatly surprised to find that this episode's plot develops in a very different direction. Whereas Twelve Angry Men's script represents a classic liberal plea for open-mindedness and tolerance, asking us not to act on knee-jerk assumptions and prejudices, this episode turns that perspective on its head. In this story, the seemingly well-meaning crusader for truth and justice is shown to be a smug, self-righteous do-gooder, who has let himself be swayed by his 'humanitarian' beliefs. Sometimes, the episode seems to be saying, our initial gut instincts about a person may in fact be true, and when it comes to the deliberations of a jury, liberal agonizing over 'reasonable doubt' may end up setting a guilty man free. I don't know if this story was deliberately written as a rejoinder to Twelve Angry Men, but it certainly functions as such; and regardless of what one thinks about the point of view it presents, it undoubtedly provides interesting food for thought. It's just a shame the surviving recording of the episode is of quite poor quality. This story was produced previously by Suspense as the episode Back for Christmas - see this entry for my full review. Plot synopsis: When two members of a film crew go out into the desert, to scout a new location, they are taken hostage by a man who tells them he is a bank robber - is he telling the truth, or are they the victims of a prank by the film's director? Review: Great title, so-so episode. It deserves credit for at least having some novel aspects, such as the way the plot turns on the possibility that it may all be a practical joke. The problem, though - and it isn't giving away a spoiler to reveal this, as it is clear from the very start - is that the audience knows that the man who takes the two main characters hostage is a bank robber, even if they do not. 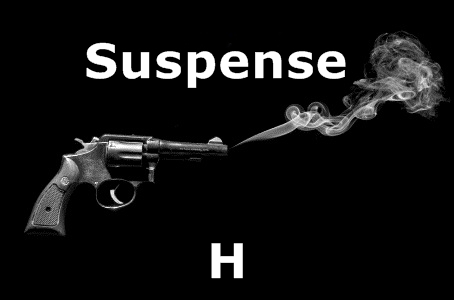 This means that, for the listener, there is very little in the way of mystery or suspense. Another issue I had with the story is that it's obviously supposed to be funny but, well, it isn't. Overall, then, despite a few interesting elements, such as some of the banter between the male and female leads, this episode is something of a misfire. Plot synopsis: A poet murders his maid after she rebuffs his fumbling advances, and then gets his brother to help him dispose of her corpse in the river by his house. Based on a novel of the same name by A. P. Herbert, first published in 1920.
Review: A short version of my review would be this: long and boring. A slightly lengthier version would be: very long and very boring. This episode offers a good illustration of why Suspense's brief experiment with hour-length episodes was not all that successful. If it had been only thirty minutes, I might have felt slightly more positive towards the episode, but as it is, at times I found it quite interminable. The dialogue is mannered and stilted, and the drama overwrought. In places, it feels almost like a parody of a British crime story (it is based on a British novel) with stiff-upper-lip characters delivering over-written and artificial-sounding lines, and with very little of the plot ringing true. However, I was sufficiently intrigued that, after listening to the episode, I sought out the Fritz Lang film adapted from the same source novel, which was released a couple of years later. Even though it doesn't have a particularly starry cast, the film version is a neglected, under-appreciated gem, far superior to the radio adaptation. The film provides a much more convincing account of the 'accidental' murder that occurs at the start - which just doesn't work in the radio play - and explanation of why the protagonist's brother helps him in covering up the crime. The symbolic significance of the river is also made much clearer when presented visually. My recommendation, therefore, is to skip this episode and watch the film instead. Plot synopsis: After a couple moves into a cheap rented house, they find a locked closet they cannot open; inhuman cries in the night and blood leaking from underneath the closet door mark the beginning of a series of terrifying discoveries. Plot synopsis: When two friends go on a hunting trip, it soon becomes clear that one of them has murderous intentions. Review: Despite the presence of Vincent Price in the cast, this is a disappointing episode. There's nothing especially wrong here, it's just that we have heard (and read and seen) so many stories that employ similar plot ideas that few will be surprised by how this one plays out. In particular, the twist at the end is very hackneyed. Only the most devoted Price fans really need to bother with this one.